Have you heard about invisible braces? 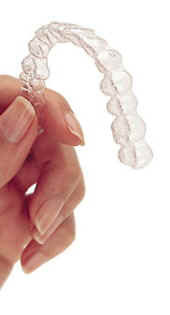 The Invisalign® system, developed in the late 90’s, uses clear plastic “aligners”, manufactured with sophisticated computer technology, to straighten teeth, rather than wire-and-bracket braces. Do they work? Yes, they do. And besides being practically invisible, their computer-designed precision enables them to move teeth more efficiently and comfortably than conventional wires and brackets. The average treatment time with Invisalign is twelve months, instead of the usual two to three years with conventional brackets and wires. These are not, however, a complete replacement for conventional braces. They cannot move teeth that aren’t fully erupted yet. They are not good for severe crowding. There are other situations where the best way to move the teeth is with conventional braces. But, because they are invisible, comfortable, and fast, patients love them. They are particular favorites with adults and older teenagers. Are you interested? Most Invisalign offices will offer you a free consultation. Visit our Invisalign referral page for a list of cosmetic dentists. We can refer you to an Invisalign-certified cosmetic dentist in your area who will be able to provide you with the answers to your questions. Note on finding an Invisalign dentist: We recommend dentists who are trained in delivering Invisalign invisible braces services and cosmetic dentistry. The reason is that when dentists have the broader cosmetic dentistry training, we feel they are better able to address your needs. For example, there may be another cosmetic dentistry solution that could be better and less expensive. Or, a combination of cosmetic dentistry services may be desirable for your case. We select our Invisalign® dentists based on training and attitude-we want them to know what they are doing and to also be responsive to your needs and desires. After a careful diagnosis, the dentist will take detailed impressions of your teeth, and these impressions will then be scanned by computer. Using the computer, tooth movements will be planned and a series of 12 to 48 clear aligners will be manufactured and delivered to your Invisalign® dentist. He’ll give you the first set, and you will snap it in. The first thing you will notice is that it doesn’t quite fit. The reason for that is that this aligner is made to fit a new position for your teeth. For the next few days, your teeth will gradually move to this new position and the aligner will become loose. Then there is a few days’ rest while your teeth stabilize in their new position. After two weeks, you snap in a new aligner, which again won’t quite fit. This process is repeated until the teeth are moved into the desired positions. For a list of the advantages and disadvantages of invisible braces, or for more information, visit our Invisalign page. 1. Do invisible braces really work? The concept of moving teeth with aligners rather than wires and brackets has been around since the 1940s, and has proven effective in thousands of cases and clinical studies. For more photographs of successful cases, click here. 2. Will insurance cover Invisalign® treatment? Invisalign® is orthodontic treatment, and if your dental insurance covers orthodontic treatment, it should cover invisible braces. 3. 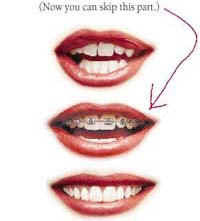 What do aligners look like? Aligners are nearly invisible and look very much like clear tooth-whitening trays, though they are made of a slightly different, stiffer material. 4. How old is the company that makes Invisalign®? Invisalign® is made by Align Technology, Inc., which was founded in 1997. 5. Do dentists and orthodontists need special training in order to use Invisalign®? Yes. A dentist or orthodontist must be trained and certified by Invisalign® before their lab will accept cases from that doctor’s office. 6. How do I know if Invisalign® invisible braces will work for my case? Make an appointment with an Invisalign dentist for a free orthodontic consultation, and he or she will let you know if you are a suitable candidate for invisible braces. 7. Is the treatment painful? No, Invisalign® is relatively painless. 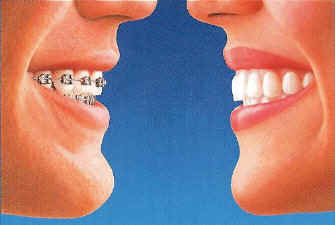 There is less mouth irritation than with conventional braces. However, there is some tenderness and tooth sensitivity to biting for a few days after each change of aligners. 8. Are there restrictions on what I can eat while in treatment? No. This is a big advantage of wearing aligners rather than conventional braces. You remove the aligners for eating, and then put them in again. It is important, however, that you brush your teeth after eating before putting the aligners back in. 9. How much does Invisalign® cost? Maybe a little more than regular braces cost. The actual cost depends on the complexity of your case. Fees generally start at around $5000 or $6000, plus a few incidentals. For additional information about Invisalign® costs, please see our page on the costs of cosmetic dentistry. 10. Will the aligners affect my speech? Some temporary effect on speech is normal as you begin treatment, until you get used to wearing aligners. This usually lasts a few days. 11. Can I smoke while wearing the aligners? Smoking can stain the aligners. Each aligner only stays in for two weeks, but that’s enough time to get them looking pretty stained. 12. How about chewing gum? Gum will stick to the aligners. Remember to remove them for all meals and snacks. Note – it is said by many in the dental profession that there is no way to clean gum off your aligner once it is stuck to it, and the only solution is to have a replacement aligner made for you. This isn’t true. Gum can be easily removed with mineral spirits (also known as turpentine). Dampen a paper towel with mineral spirits and wipe the aligner clean. Then clean off the mineral spirits with cool soapy water. 13. How often must I wear my aligners? Wear them all day and night, except while eating, brushing, or flossing. Leave them out for no more than a few minutes each day, during these activities, or you will have your teeth moving back and forth a lot, and this isn’t good for them. 14. Can I use the aligners while bleaching my teeth? Yes, actually, the aligner can double as a bleaching tray, enabling you to whiten and straighten at the same time. Some offices offer a reduced fee for bleaching if you use the aligners as your bleaching trays. The usual problem patients are seeking to correct with invisible braces is crowding – the teeth are too big for the space available. With conventional braces, this space is usually obtained by extracting some teeth. With invisible braces, however, we tend to lean toward shaving just a tiny bit off each of several teeth to make extra room. This shaving is called reproximation. Besides making treatment go faster, the end result tends to be more stable with that approach. Some teeth are kind of round-shaped and are hard for the invisible braces to “grab” in order to move them. In these cases, we bond a nearly invisible “attachment” to the tooth – made of composite filling material that is color-matched to your tooth, which enables the aligner to hold onto the tooth and apply a gentle moving force to it. This happens often with lower premolars and canines. This attachment is then removed at the end of treatment.